Variation among habitats can cause differential selection on different populations of a species, leading to local adaptation of populations to their specific habitats. While the habitat variation can be abiotic, symbiotic species are exposed to additional layers of variation and may locally adapt to their symbionts. The project is tailored to assess local adaptation in the mite Poecilochirus carabi, which lives in close sympatry with Nicrophorus burying beetles. We analyse the cross-population variability of Poecilochirus mites across different geographic scales and test predictions for (co-evolutionary) local adaptation. The project is funded by the Freiburg Research Innovation Fund and the German Research Foundation (DFG). We also investigate the sensory ecology of the mites and the chemical substances that enable them to differentiate between beetle species, using behavioural experiments and analytical chemistry methods. Schedwill, P., Geiler, A.M., Nehring, V. (2018): Rapid adaptation in phoretic mite development time. Sci. Rep. 16460. Fecundity and longevity are typically traded off: Animals of most species die earlier when they produce more offspring. Social insects with their reproductive division of labour among queen and workers are a striking exception from this pattern: Queens are generally highly fecund and long-lived compared to the workers, which typically die young and do not reproduce. Theoretical models indicate that the workers’ options for direct fitness are an important factor in the selection for queen longevity. Within the framework of the research unit FOR2281 (“Sociality and the reversal of the fecundity/longevity trade-off”) we are testing this prediction and analyse the molecular networks that lead to the strinking ageing phenotypes across the ants. This is a collaborative project with Susanne Foitzik and Romain Libbrecht (both from Mainz), fu nded by the DFG. Communication is the key feature of societies. 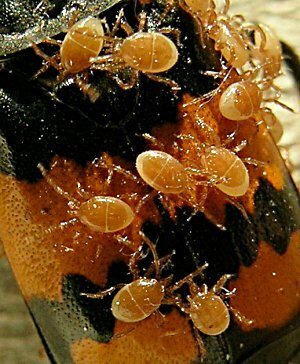 Besides humans, the pinnacle of social evolution is embodied in the social insects, whose organisation is maximised by elaborate division of labour. Despite being object of intense research spanning many decades, the communication codes of social insects and their evolutionary origin are still largely unknown. 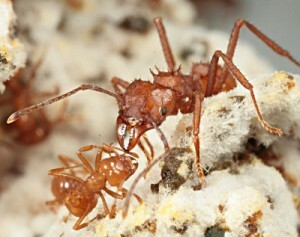 As a model system I used an ecologically tremendously successful and important group of ants, the leafcutters – which build societies of millions of workers – to find the general proximate and ultimate mechanisms underlying successful communication both at the individual and at the colony level. I also also addressed the question of whether individuals could exploit information for their personal benefit at the expense of the society. Finally, studied the adaptations that allow social parasites to break the communication code and invade leaf-cutting ant societies. I used an integrated multidisciplinary approach including electro- and neurophysiology, genetics, chemical analyses and behavioural observations and experiments. Funding for my project was provided by CODICES and the German Academic Exchange Service (DAAD).